A good hairstyle will make anyone presentable and well groomed. In order to have a good hairstyle once should have healthy and hydrated hair. While some are blessed with silky smooth hair naturally many are not blessed with silky hair. Sweet almond oil comes to rescue when we are facing severe hair related issues. 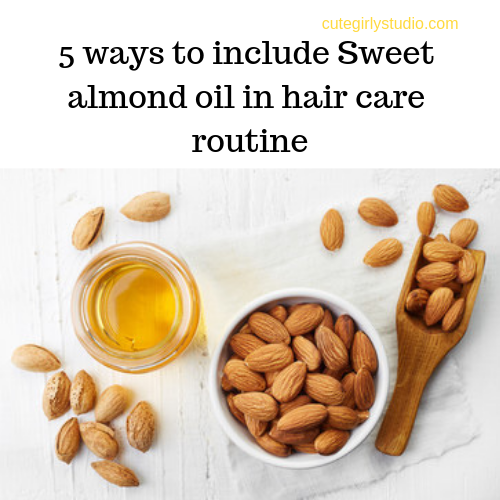 In this post, I will share 5 ways in which you could include sweet almond oil in your hair care routine. Why should you own a bottle of sweet almond oil? Not only our skin our hair also needs moisturization. Sweet almond oil moisturises the hair strands. It moisturizes the hair without making it sticky and greasy. Since it has immense moisturization property, sweet almond oil keeps the hair smooth and silky. It also prevents split ends. Our hair also damages when it is exposed to Sun. Sweet almond oil helps to repair UV damage and at the same time prevents from further damage. Whether it be wavy or curly, sweet almond oil defines the natural hair pattern in an elegant way. Sweet almond oil when applied on the scalp, stimulates hair growth and also reduces shed rate. Almond oil soaks into the scalp easily, without clogging pores, and keeps your scalp hydrated and clean. It efficiently dissolves dirt, oil, pollutants, and dead skin cells to unblock clogged hair follicles, allowing the hair to grow. Does your scalp is itchy? A simple scalp massage with sweet almond oil can soothe the scalp and reduce itchiness. Sweet almond oil treats dandruff efficiently due to its antifungal property. A blend of sweet almond oil and coconut oil can do wonders on scalp that is prone to dandruff. Mix the above mentioned oils and store it in a bottle. Use this to massage your scalp twice a week and watch your hair growing. If you have extremely frizzy hair then add a few drops of sweet almond oil to your regular conditioner. It will tame the frizziness. Take 2 to 5 drops of sweet almond oil and warm it between your hand. Apply this on damp hair as a leave on conditioner. This will keep your hair smooth and also prevents split ends. It also prevents UV damage. Mix the above mentioned oils and store it in a bottle. Use this to massage your scalp twice a week and it will reduce dandruff within a few uses. Blend 1 banana in a blender and add sweet almond oil to the mixture. Apply this hair mask all over the hair length to deep condition the hair. Using this hair mask once a week will improve hair’s texture. This hair mask keeps your hair hydrated and silky. These are some of the benefits and some ways in which you can use sweet almond oil in your hair care routine.